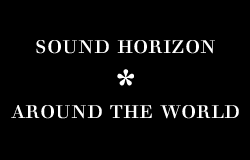 Known as the Gensou Gakudan (幻想楽団 – The Fantasy Band), Sound Horizon has but one official member: Revo. All other members are there by invitation, whether singers, seiyuu or musician; the cast-list varies from album to album. During the first era of Sound Horizon, the only collaborating members were Jimang and Aramary, but since 2006, other singers have collaborated. Revo is the composer, arranger, writer and producer of Sound Horizon, and its only constant member. He started composing in the 90’s and uploaded his works on a website where he signed as “G.Revo”. 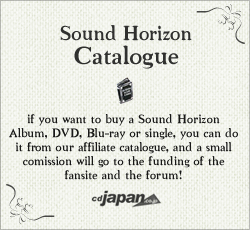 The first album under the name of Sound Horizon was released at the Comiket 2001, and he was the only credited member. He usually plays the guitar, and occasionally piano, bagpipe and other instruments. Since Roman (2006) he also participates as a singer. Since the stablishment of the Sound Horizon Kingdom, Revo has played the role of king. Therefore, people refer to him as His majesty. Aramary was the first singer in Sound Horizon. She started in 2002 with the 2nd Story “Thanatos” and left after the 4th Story “Elysion”. She took the leading role of the band during that period, and her voice became an icon of the first era of Sound Horizon. She is well known for her narration (seiyuu) skills; she is able to imitate a wide range of different voices, such as children and elderly women, altering her vocals to suit each role. After leaving Sound Horizon, Aramary joined the band Rain Note and released an album and a single. She also works as a seiyuu for several doujin circles and TV spots. Shimotsuki collaborated with Sound Horizon during the doujin stage, singing in Lost and Chronicle 2nd. She always had a close relationship with the band, participating once again in Moira. She is a well-known singer and composer, working as solo artist in both doujin and major releases. Lost, Pico Magic, Pico Magic Reloaded, Chronicle 2nd, Elysion~Prelude to Paradise, Schwarzweiss, Moira. YUUKI (Yoshida Yuuki) is one of the main singers from the second “era” of Sound Horizon. She was a Japanese Idol in 2003, when she was part of a Unit called SpringS. She also took part in several TV Doramas that aired NHK and Fuji TV, as well as some commercials. KAORI (Kaori Oda) is one of the main singers from the second “era” of Sound Horizon. Before joining Sound Horizon, she was part of the vocal group CHIX CHICKS (formerly BJ GIRLS), which she left in 2008. She is also part of Yuki Kajiura’s FictionJunction project, and she has sung theme songs for several animes such as Baccano!, Tsubasa Chronicles and Pandora Hearts. REMI is one of the main singers from the second “era” of Sound Horizon. She has taken part in a lot of “free collaborations” for animes like Naruto, GANTZ or Jigoku Shoujo. She has a very special operatic voice, although very light and similar to a mezzo-soprano. Some roles she has played in SH are Reine Michèle (Roman), Trin (Seisen no Iberia), and Myu (Moira). RIKKI joined the band along with the other second era vocalists, but her first collaboration with Sound Horizon was the Image Album LEVIATHAN, while Aramary was still in the band. She is a famous shimauta (traditional Okinawan music) singer, and is mainly know for having sung “Suteki da ne?” in FINAL FANTASY X. She gave birth to twins in 2008 and left the band during that year, but she returned in 2009. Her voice is very high-pitched and influenced by traditional Japanese singing. Some roles she has played in SH are “Mother” (Roman) and Saranda (Seisen no Iberia). Azumi Inoue collaborated as a guest vocalist in Roman, where she sang the role of Étoile’s mother (Hoshikuzu no Kawahimo) with YUUKI. She also replaced Yoshimi Iwasaki during some of the Moira Story Concerts (2009), and took the role of Mother Holle and Aprikose in the 7th Story Märchen. She has a sweet melodic voice. Miki joined SH as a support vocal in Moira (2008). She was initially meant to replace RIKKI, who had temporarily left the group, and also participated in the 3rd Territorial Expansion. Her voice is similar to Geila Zilkha’s, one of the singers of the image album Leviathan. She plays Therese von Ludowig in Ido e itaru Mori e itaru Ido and many villain roles in Märchen. Minami Kuribayashi joined the band as a “guest singer” in Moira in the role of Artemisia. She has been renowned for her voice acting skills, and also for her songs in several animes aside from her role in Sound Horizon. In the latest Sound Horizon release, Märchen, she took the role as the Bluebeard’s dead wife, making her as one of the Seven Dead Princesses. Joelle was born in USA before moving to Akita, Japan. As a daughter of American father and Japanese mother, she is fluent in speaking both English and Japanese. Her influence for music came from her father, who is also a musician. Joelle is a part of duo singer, Joelle and Clinton before invited to join Sound Horizon in their latest releases, Ido and Märchen. She plays the role of Elisabeth von Wettin in both releases.